John F. Kennedy had “Camelot.” Barack H. Obama had “Hamilton.” Only 100 days into his presidency, Donald J. Trump already has his own Broadway musical. “Anastasia” opened Monday at the Broadhurst Theatre, and it’s a show that pays homage to the kleptocracy that was the Romanovs of Russia. How could our president not be thrilled? Early in the show, a Jared Kushner lookalike sings of the glories of his pre-Communist nation in the song “My Petersburg,” even though the place has been renamed Leningrad. Later, the Ivanka Trump-like heroine shows her royal privilege by insisting that a fellow traveler ask her permission to smoke on the train ride from the U.S.S.R. to the West. Remember, this is 1927. There’s also the fake news that this girl who calls herself Anya might actually be Anastasia, the sole surviving member of the Romanov family that ruled the country as czars until the Revolution. Terrence McNally’s book goes through so many contortions on the subject of Anastasia. She is the royal daughter. She isn’t the daughter. She is, then she isn’t again. But then why does this Russian girl know so much about the Romanovs’ pet cat and why is there a diamond the size of the Ritz sewn into her rag of an overcoat? Also unexplained is where Anya/Anastasia learned to jump from trains a la Tom Cruise and defend herself (and her boyfriend) by kicking men in the nuts. No Disney princess ever did that before! 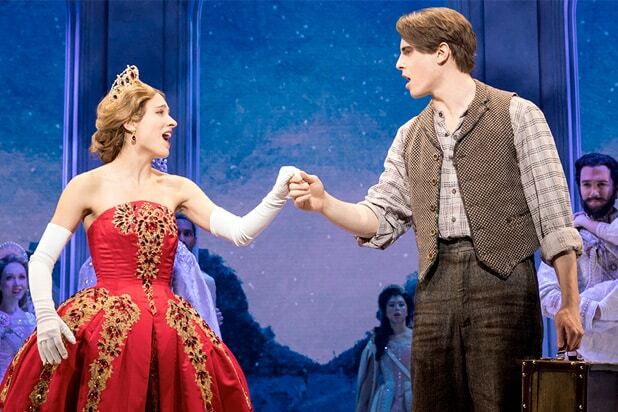 As the two lovers, Christy Altomare and Derek Klena display pretty singing voices, and otherwise show as much depth as the animated-film characters their roles are based on. But about that train ride: McNally’s book has Anya and Dmitry disguising themselves as members of the Ballet Russes on the trip from Leningrad to Paris. For a musical that’s all about the effects of the Bolshevik Revolution, maybe somebody involved ought to have Googled the Ballet Russes, which never performed in the U.S.S.R. or Russia because of that upheaval. More fake news. Back in the 1970s and ’80s, Stephen Sondheim taught Broadway that you could turn almost any subject into a musical. That the master composer never set one of his shows in the U.S.S.R. is telling. 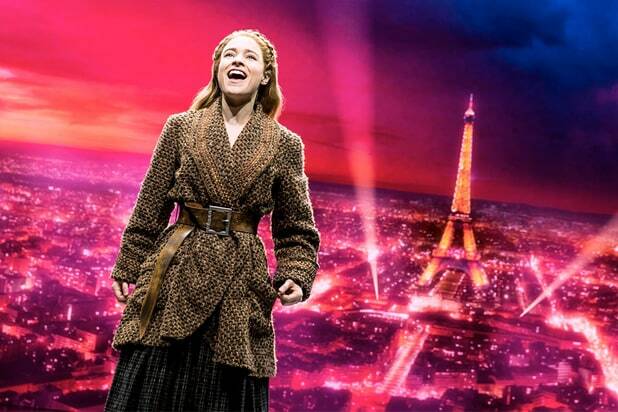 It’s innately dreary, and you can almost hear a big sigh of relief from McNally and songwriters Stephen Flaherty and Lynn Ahrens when the second act of “Anastasia” opens in ooh-la-la Paree! Anya has cashed in that big diamond, and she’s living it up in high style with a blond coif worthy of Ivanka. Better yet, McNally retires his jabs at Leningrad and uses his rapier wit to go after… Cleveland, Ohio. Late in “Anastasia,” the Communist official (the braying Ramin Karimloo) in charge of assassinating Anya lets go with the show’s one charge against the Romanovs, that they’ve robbed Russia blind and left it with nothing. Very unflattering assessment, but it’s a raspberry thrown by the musical’s villain. Otherwise, the Romanovs are a family to be both pitied and revered. Donald would like that. McNally, Flaherty and Ahrens’s last Broadway collaboration was “Ragtime.” Their penchant for the solemn and the high-minded is now under control. Only every other song is an anthem. Darko Tresnjak directs with an eye on the most recent film version of “Anastasia.” Alexander Dodge’s scenic design relies heavily on Aaron Rhyne’s gorgeous projections. They’re like watching a movie.